Honeybees are highly independent. They can fly miles for food, defend themselves against attack and survive the harshest of winters, despite being very vulnerable to cold. But though they are tough, there are some basic things bees need to survive and plenty of problems that can befall them. We have looked at what bees need. These include a nearby source of water for cooling the hive and dissolving crystallized honey. They need peace from loud noises and disturbances. They need an ample source of nectar and pollen – the closer the better – and they need warm weather in the summer in which they can fogare. In the winter bees need to keep their body temperatures above 57 F. This means they need shelter and enough stored honey that they can stay inside and keep warm for months. They use the remarkable concepts of fat bees and the winter clusterto survive. From too much heat to too much cold, from a dead queen to an overzealous beekeeper, bees face a lot of challenges. Let’s take a look at the main threats bees face. Before we dive into these threats, we want to put them in an overall context. Beekeepers around the country and around the world keep bees successfully. Many first-year beekeepers are successful too. After, all successful beekeepers have to start with their first year! Some of the threats can be daunting. However, none of them are certain to strike, some are rare and some may not even be a threat where you live. Some are very serious and can threaten your colony. Others are problematic but can be resolved. Others still resolve themselves through natural processes or through the efforts of your bees. Some are entirely avoidable, others are unavoidable but are curable. Some problems are never seen by some beekeepers, even experienced beekeepers, and others that virtually all will see at some point. While the number of threats may be discouraging, as a beekeeper you have many options as to how you help your bees avoid or recover from them. In short, our goal here is to educate, not discourage. Disease is a major concern in beekeeping, particularly considering that some of them are under suspicion of having an association with Colony Collapse Disorder(CCD). Here is an overview of some of the main diseases and how to recognize them. American Foulbrood is extremely contagious and a major threat to honeybee populations. It only affects worker, queen and drone larvae less than 2 ½ days old, but that’s more than enough to wreak total havoc. The larva eats the spore-forming bacteria, which then multiplies inside the larva until it dies. Larva turns from healthy, succulent white to a flattened brown. Eventually the dead larva will harden to a small, black scale inside its cell. This scale is teeming with new foulbrood spores. You can usually spot American Foulbrood from a spotty mix of capped and uncapped brood, with capped cells having punctured or sunken tops. You can also detect it by the dangling remains of decomposed pupae hanging down from the tops of their cells or by inserting a small stick into a dead brood cell. If the brood stretches back out on the stick with a gluey consistency, you probably have an outbreak of American Foulbrood. American Foulbrood spores can stay active in beekeeping equipment for decades and are highly resistant to treatment. After an outbreak, your only real course of action is to destroy the colony and burn the equipment. The drug Terramycin can be applied monthly to prevent the appearance of the disease. If you choose to use it, check with your state to see if its use is legal. European Foulbrood is another bacterium that can get into food and populate inside the brood. It usually appears in spring and early summer and can be picked out by a spotty pattern of capped and uncapped brood. Brood killed by European Foulbrood don’t take on the gluey consistency associated with American Foulbrood. Unlike American Foulbrood, European Foulbrood is not a death sentence for the colony and will sometimes disappear with a strong nectar flow. If it turns out to be persistent, the best course of action is to requeen the colony, which gives the bees a lag time between laying to clear out the infected brood. Chalkbrood is a fungus that enters brood through food. It waits until the brood is sealed in its cell, then grows and takes over the larva. Larva killed by chalkbrood take on an opaque, white appearance, hence the name. Chalkbrood is usually found in late spring on the fringes of the frames. You’ll know you have it if you see little chalk nub bodies outside the hive entrance, where worker bees have discarded them. There’s no real treatment, though requeening has been known to help. If the workers manage to remove all the infected brood, the colony should survive. Sacbrood is a virus that is not usually a problem since it affects only a small number of brood. The brood dies after its cell is capped and its body takes on a liquidy consistency inside a tough outer skin. There’s no treatment, though requeening can help. While colonies are rarely wiped out due to sacbrood directly, they may be weakened and vulnerable to other threats. Nosema forms spores inside the digestive tract of adult bees. It is, basically, bee diarrhea. It causes bees to defecate inside or down the front of the hive, which spreads the disease more. Nosema shortens worker bee’s lifespans and their ability to make royal jelly. If it infects the queen it can seriously interfere with laying. Healthy, well-fed hives with young queens are less likely to get nosema. The drug Fumagillin can be used on young or overwintering hives. Paralysis comes in two forms: chronic and acute. It can result from eating pollen of certain plants and fermented stored pollen. Paralysis is easy to detect and the bees lose their hair, take on a greasy look and tremble. A colony can recover from paralysis naturally, but if it doesn’t, you can requeen with a different strain, as weakness to paralysis is often genetic. On top of diseases, honeybees have plenty of enemies in nature. They are far from helpless, of course, and can fend for themselves very well, but it’s good to know what your bees are up against. The stories are true – bears really do love honey and they’ll go to great lengths to get it, including smashing your equipment beyond repair. If bears are a problem in your area, consider raising your hives on a bear proof platform or surrounding them with an electric fence. If a bear has already found your hives, unfortunately, it will keep coming back for more. Once this happens, the only real course of action is to move the hives. Mice are a problem in winter, when they’ll crawl inside a nice warm beehive to build their nests. A mouse will stay in the corner of the hive, well away from the bees, but it will chew through wax and frames to make room. The smell of its urine will put your bees off the hive in the spring. Keep mice out by adding an entrance reducer or mouse guard in the fall. If you find a mouse in your hive, chase it out and remove its nest and any frames it has chewed. Wax moths lay their eggs in beehives and stored frames, where they lay their eggs. The resulting wax moth caterpillars can wreak havoc, tunneling through wax foundation in search of pollen and brood. A strong hive will simply throw the eggs out, but weak colonies and especially stored frames are at risk. To avoid wax moths in stored frames, store them either in very cold temperatures or with granules of paradichlorobenzene (PBD). Wasps, hornets, and yellowjackets will sometimes kill bees at the entrance to the hive or out in the wild. The best way to deal with them is to find and chemically destroy their nest. Alternatively, you can move your hives away from the nest or use an entrance reducer to help the bees guard against their attackers. Flies such as the Southern Bee-killer and the Texas Bee-killer are known to eat bees. If they come after your hive, there’s nothing to do but move it to a new spot. The Small Hive Beetle will infiltrate the hive where it feeds on pollen and lays eggs, sometimes overrunning a colony. If your hive has an infestation, you may choose to treat it with the appropriate pesticides. Termites will burrow through your hive and have been known to completely destroy bottom boards. Protect your hive by never letting it sit directly on the ground, using a hive stand. Spiders catch insects, so it stands to reason that you want to keep them well away from your bees. Knock down any webs you find near your hive, especially directly in front of it. 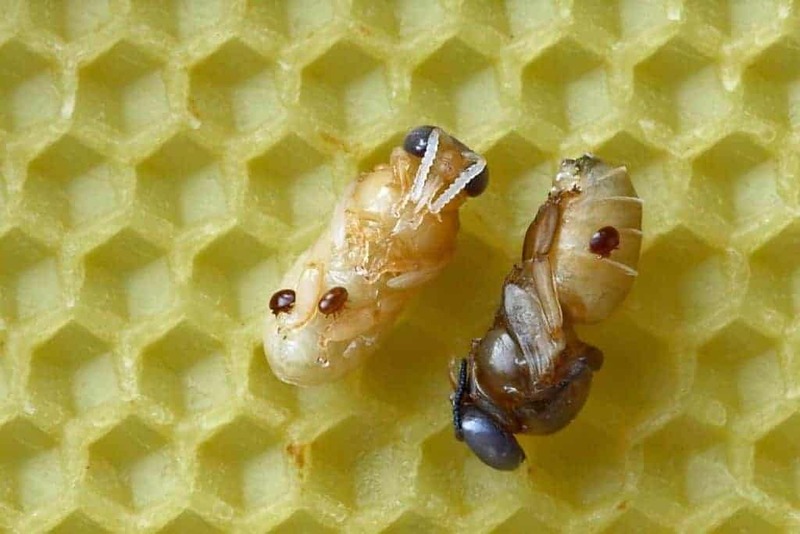 Mites are one of the most serious problems for bees and beekeepers. 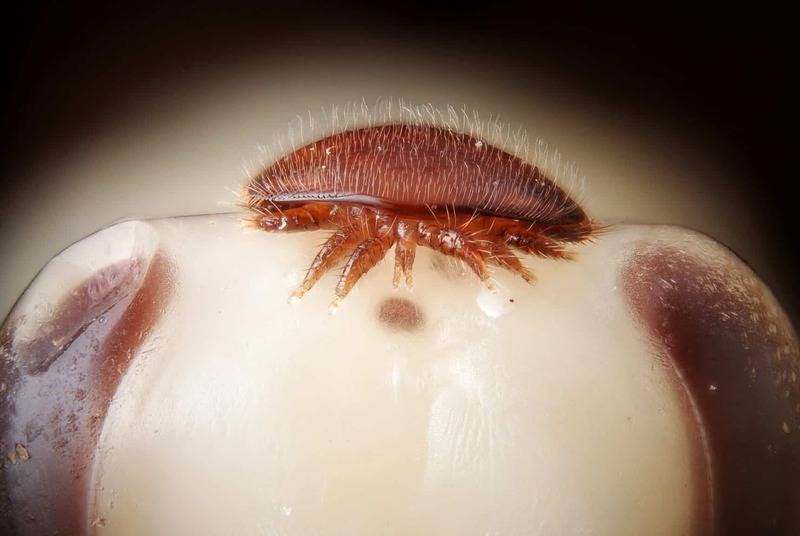 The most serious of all is the Varroa mite, which is thought to have a possible link to CCD. They first appeared in the US in 1987 and can devastate colonies. It’s often hard to notice Varroa until it’s too late, but one of the best ways is the sticky board. This is a sticky sheet underneath a mesh cover that can be used as a bottom board. Mites often fall off bees and have to crawl back up into the hive, but with the sticky board they get stuck to the bottom. The mesh gives the much bigger bees something to stand on without getting stuck themselves. Treatments for varroa mites ranges drastically. For a long time, Apistan strips were the only treatment available in the US. Over time the widespread use of Apistan created a serious resistance to it. Sometimes it still works, but other times it doesn’t. Thankfully there are other treatments available, such as Coumaphos strips, Apilife VAR and Apiguard. All of these treatments have specific instructions that have to be followed regarding honey (to keep it from getting contaminated) so whichever you choose, be sure to follow the instructions on the label to the letter. The latest generation of mite treatments includes Formic Pro, which is a new product from the same company that produces the previously popular Miteaway Quickstrips. Tracheal mites are a lesser problem than Varroa mites, which is good, because they’re much harder to find! Tracheal mites lodge themselves inside the throats of bees and can only be seen if you remove the bee’s head and look at its throat under a microscope. Luckily, a lot of honeybees have a resistance to tracheal mites, meaning that even a colony that becomes infested will probably not be overrun. Tracheal mites cause a shorter lifespan and make it harder for bees to keep warm, which means the real risk is your colony not surviving the winter. One of the most deadly hazards to bees comes from humans, in the form of pesticides. Bees are insects, after all, and chemicals designed to kill insects don’t make exceptions for the ones we favor. Unfortunately, since honeybees will forage for miles, avoiding spraying on your own property often isn’t enough. It can be be difficult to convince your neighbor to avoid the use of pesticides. You are welcome to try and you may succeed to some extent, but if you don’t, the next most important thing is to compromise and keep the lines of communication open. Ask your neighbor to let you know when they will be spraying. If a lot of chemicals are involved, you can move your bees at least three miles away from the area for the day. If that’s not feasible – and it will rarely be so – you can drape wet burlap over the hives during the time of spraying to discourage your bees from going out. 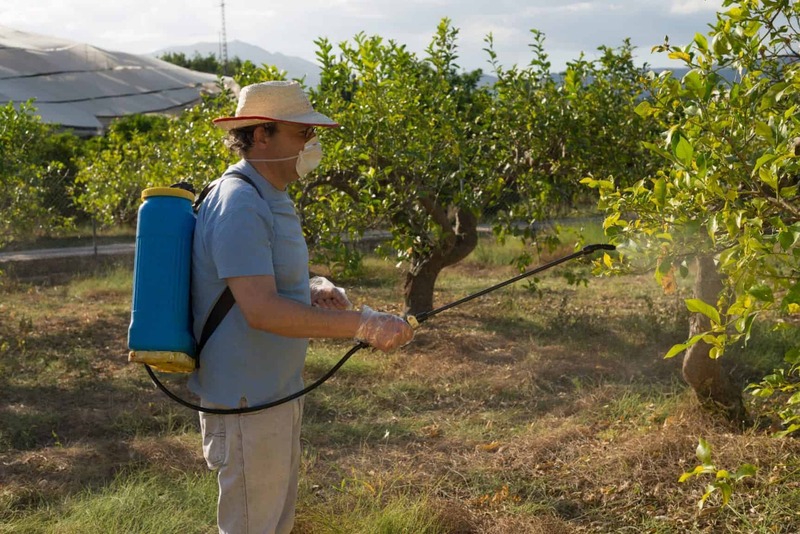 If you have to spray on your property, be sure to opt for pesticides that are less long-lasting. Many brands have less than eight hours of residual toxicity. If you spray in the evening, it will kill harmful pests overnight and be gone by morning when the bees begin foraging again. Of course, the best approach is simply to avoid pesticides. We mentioned that bears have a desire to get their paws on honey in a beehive and will go to great lengths to get it. It turns out that bees from other colonies do too! The smell of honey is irresistible and the threat of robbers – bees from one colony attacking another – is a frequent concern. This is one reason why the entrance feeder, sitting on the outside of the hive as it does, is not the feeder of choice for many beekeepers. By using an entrance feeder you are presenting an attractive source of food, not just to your bees but to others too. There are other options available, such as the highly-popular Ultimate Hive Top Feeder, which are placed on top of the inner cover and surrounded by a box, which greatly reduces the chances of robbing taking place. The robbing threat can be a particular concern with a young or weak colony. For example, after the bees in a package are installed, they have a good deal of real estate to protect at the entrance, at least in relation to their (relatively) small numbers. This is a good time to install an entrance reducer, specifically to limit the space to be defended if robbers attack. I have not spotted any problems with my hives, yet.